Implant-supported dentures are the latest choice for the person on the go who doesn’t want to worry about loose-fitting dentures. Implant-supported dentures are pure titanium devices that are placed into the jawbone. Titanium is able to bond with the bone, a process known as osseointegration. Osseointegration may stop or slow down the bone loss that occurs if your teeth fall out or are removed. Today, implant supported dentures are used to replace one tooth (crown), several teeth (partial bridge), or full upper or lower dentures. For implant-supported dentures that restore your radiant smile and the functionality of your mouth, call North Hill Denture Clinic in Calgary, AB, today at (403) 282-6126! 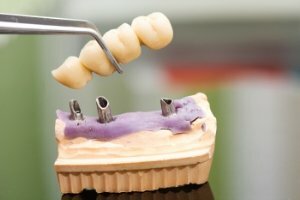 Why choose implant supports instead of denture glue? Dentures held in place with glue require a messy application and cleanup process and are prone to fall out. In addition, when placed in the mouth, glued-in dentures create painful pressure points or cause a pinching sensation. Some patients with dentures explore implant-retained dentures as a glue-free alternative, but this option requires several surgically affixed implants in the jaw that are not removable for cleaning or adjusting. At North Hill Denture Clinic, we’re proud to offer a third option: implant-supported dentures. Implant-supported dentures offer you the benefits of removable dentures without the hassle or inconvenience of glue. Like traditional dentures, implant-supported dentures are removable, but they anchor firmly in place using clips attached to a permanent jaw implant for a snug fit. Fewer implants are required, making the process less invasive than permanent implant-retained dentures. While extremely sticky or hard foods may still damage the actual prosthetic teeth in your dentures, you’ll find that eating many of your favorite foods becomes easier, along with talking and smiling. In addition, cleaning your implant-supported dentures is a simple process. If you’re unhappy with uncomfortable or loose dentures, ask us about implant supports. For patients who are struggling to eat and speak normally with their natural teeth, implant-supported dentures may be a solution, even if you’ve never used dentures before. Age should not be a deterrent. If you are healthy enough to undergo routine dental work then you are healthy enough for implant supported dentures. The cost of implant-supported dentures varies with each case. At your consultation, your denturist will discuss the costs with you prior to beginning treatment. As a general rule, the cost of implant-supported dentures and the surgery itself is not usually covered by dental insurance. However, dentures are tax deductible and are more affordable than you might think. Note: The system can also be used for Patient-removable dentures. Taking care of your implant-supported dentures is no more difficult than regular dentures and is often more convenient. To help your dentures last as long as possible and look like healthy, natural teeth, you’ll need to remove and clean them in water at night. Pay special attention to gently cleaning around the attachments in your jaw and on the denture device to avoid decay. These attachments points are usually the first elements that wear out and require replacement about once a year under continued daily use. In addition to your regular at-home care, it’s important to visit North Hill Denture Clinic in Calgary, AB, for regular checkups as recommended by our staff. We’ll monitor any uneven wear and tear, make adjustments to correct sore or pinched areas of your gums and cheeks, and use X-rays to check for proper placement of the implants and abutments inside your jaw. 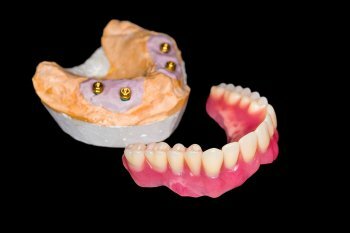 With these basic at-home and in-office steps, implant-supported dentures will last for many years. Call to schedule a one-on-one consultation for implant supported dentures in Calgary at (403) 282-6126.